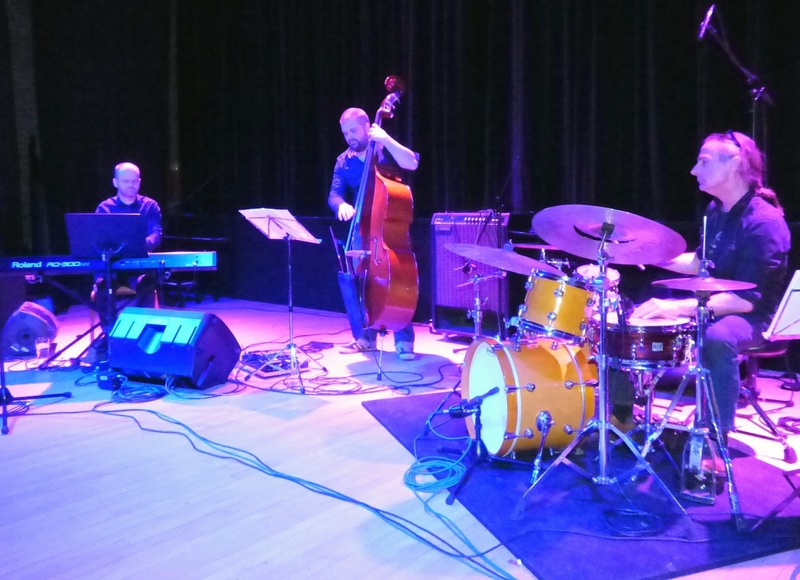 Paul Susans (bass); Rob Walker (drums); Paul Edis (piano/clarinet). A very agreeable venue: easy to find, free parking, tables set out in jazz-lounge style and a good bar featuring Pennine Pale on draught. That made me feel at home! We were promised a splendid set of “genre-busting tunes” and Triptych served up just that. 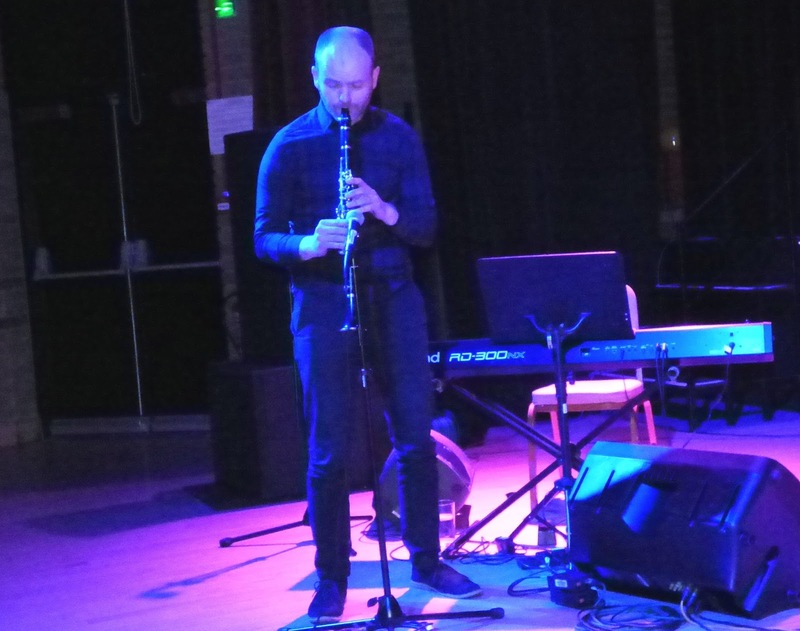 Montage – an Edis original, from his solo CD, Just Like Me, – was first up, and very different in trio format. Louder and more dramatic here: it would still work well in a film but a different kind of film! Sketch 69A was penned by bassist, Paul Susans, resident of Hexham and familiar with the A69 after which the piece is named. A sonorous bass intro then a driving, rhythmic tune helped along, at first, by Walker’s brushes then intensified later when he switched to sticks and cut loose. Walker’s drumming – I should really say percussion, as so many effects were created not only with the hands, at least two different kind of sticks, brushes and mallets but also with less expected kit such as producing a metallic saw-like “zing” by running a bow across the edge of high-hat or cymbal and, for a long spell in one of the suites, producing rhythms on an udu drum which featured in my notes as “a pot-thingy”! I wasn’t actually that far wrong, “udu” being the word for vessel or pot in Igbo (Nigerian). Being next to the drums isn’t always ideal but here it was a pleasure. The name, Triptych, is most apt: not a front man backed by two others but three equals working together to make one compelling and varied sound – brilliant! 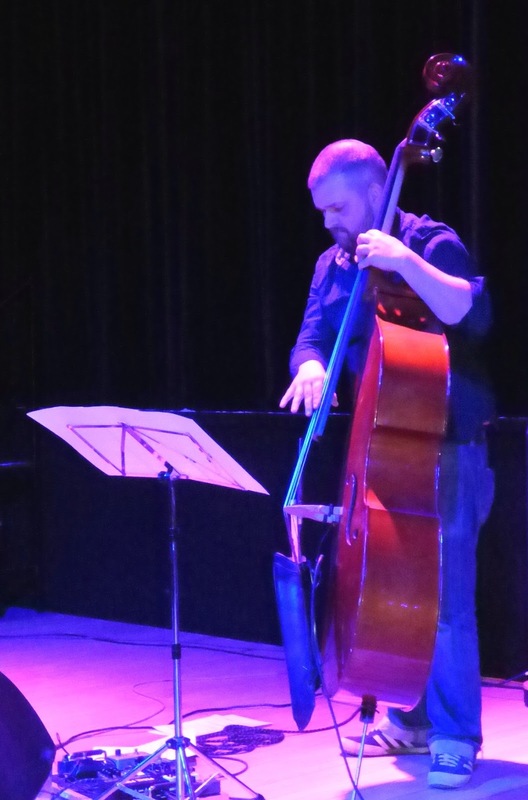 Paul Susans started on upright bass, as in a conventional trio with brief solos gaining applause in Montage and Moonlight in Vermont, for example. About half way through the set he switched to electric bass and did amazing things with a foot-controlled gizmo which moved the group from standards into funk and beyond, almost to prog-rock. We were promised genre-busting and we got it in spades! 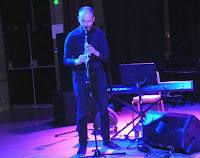 Edis, not content with scintillating piano, gave us clarinet in Moonlight in Vermont and in both of the suites. And all three are composers – numbers by the two Pauls including bassist Paul’s 12th.Moon of Venus being capped by Rob Walker’s Mr. Blister: rousing enough to be an encore and funky enough to be categorised in my notes as “all about the bass”! Fragmented Suite consists of 3 parts: Murmuration (Edis); Dr. Gonzo (Susans) and Dark Ages (Edis again?). Murmuration, as with Montage earlier, is so different to the CD version. Here, loud bass and noisy cymbals make the birds less starlings, more Hitchcockian crows! Bass, appropriately, linked us into Dr. Gonzo featuring the aforementioned hand drumming, then we arrived at the most memorably atmospheric “fragment” of the evening, The Dark Age. Plaintive clarinet against resonant bass (bowed sometimes like a wailing wind) with Walker’s udu drum adding weird rhythms all make this dark indeed: think Glencoe (when mallets and loud piano ramp up the volume later it sounds like a battle is in progress), think Macduff’s line: “new widows howl, new orphans cry” – it’s powerfully evocative. It quietens briefly as Walker deploys his zinging bow then builds up to a deafening crescendo at the end. No wonder Edis announces: “Now for something completely different” before launching into the two “moon” tunes! 73 is another three-piece, incorporating Cerebral, Beer for Breakfast and 73 Rhythms (?) by Edis, Susans and Walker respectively. Electric bass provided a loud opening and at times, in Cerebral, carried the melody too. At one point (we may have been into Beer for Breakfast now, I’m not sure) Susans was playing so high it sounded like a 6-string lead guitar before reverting to funky bass. Walker with mallets and cymbals held the fort solo while bowed double bass and clarinet reappeared. 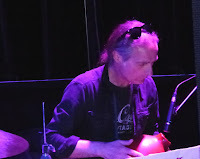 A low double bass note was indefinitely sustained by the gizmo while its player walked over to his electric bass and the two sounds merged, Edis, meanwhile, was (loudly) back at the keys and from here it was all about the drums with Walker conjuring up a big, crescendo finish!